Study skills are an integral part of teaching and learning. In this session, we covered ways in which we could encourage students to work hard, study hard, and improve their study skills. Grouping people together allow study skills and results to move together. Students can teach one another, pointing out flaws in thinking and expanding knowledge with examples which make sense to other students. You will find that students almost always cluster together, but that can be hurtful. Some people take the limelight or try to remove themselves from the group, or will work alone. Try to combat this by assigning groups or by building in a contract. Prior to assigning groups, have your students take a free DISC assessment or Myers-Briggs Personality Test. Use the scores from the test first to talk about what the students learned and how accurate it was, and last to use it to help put your groups together. Just like you wouldn’t want a group of all followers, you don’t want a group of all leaders either. You know your students, so split them into groups with at least one strong leader and don’t double up if you have students who drag behind. Use a contract to clearly point out who will be doing what jobs. There is not a question as to who is responsible for what items, and encourage your students to help one another or “vote a member off the island”. Make it known that a member voted off the island by their teammates can make a maximum of 70%. Many will step up their game. Cramming in some courses is a really big problem. If this continues to be an issue, consider watching the videos by Dr. Chew about using metacognition. Integrating these into your classes can be a one-shot assignment or it can be part of your course resources section and available to all students. Guided questions are very helpful as a reflective assignment. Asking students what they’ve learned, and what was difficult is fairly boilerplate. That doesn’t leave you without other solid questions like: How will you adjust your plan to avoid this next time? How can you do better? What study methods will you use to do better next time? Consider using scaffolding. Rather than a single paper worth 30% of their grade, break it into sections under review. Also revisiting the study habits about a week after the exam— what did you do to study for the exam, how long did you study, and based on your grade, did it help you? Mixing this with Metacognition will be a strong asset for you. Quizzes are used to gauge student understanding. Consider a consistent delivery methods, such as having a quiz every Friday, and always over the same material— things covered in the class that week. With 10% of your final grade based on homework and another 10% set for quizzes, students are not engaged to push themselves. Failing these, a student can always get a B- or pass. Consider bumping up these items. Often, its great to point out that 3-4 hours of study time over the semester will save you 4 months of your time by not having to take the whole class again. Sometimes you can revisit the idea that low stakes doesn’t exactly mean “low stakes”. 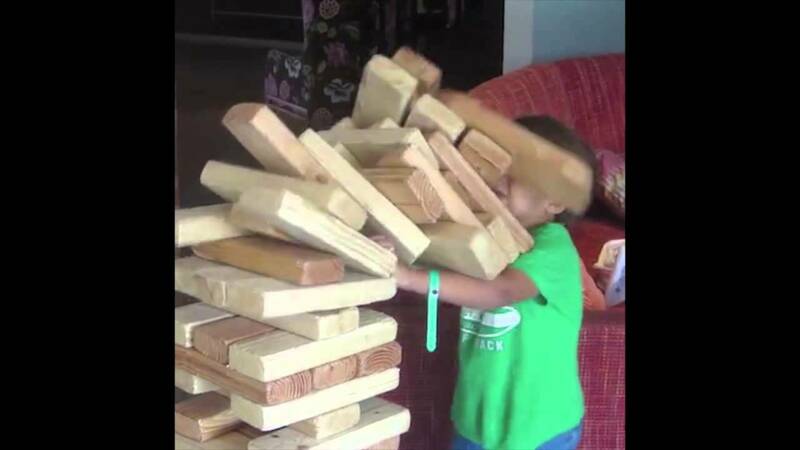 Every missed item is like a missing block in a jenga tower. (It could end up getting you right in the face, see below). 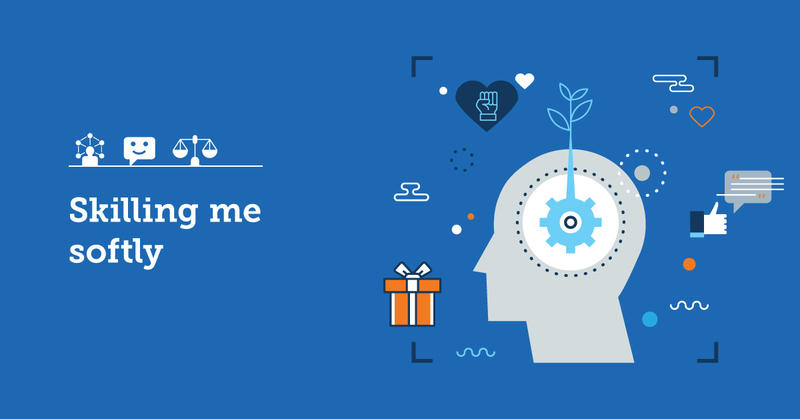 Many people in the business industries we serve feel that students are missing soft skills— the unspoken items and ideas which are part of every person’s working world. What do our students know? What don’t they know? What do they know they don’t quite know well enough? What do then not know that they don’t know? It is often the Unknown Unknowns that bite us the hardest, because we cannot conceive that we have a gap in our knowledge. What’s the workplace-appropriate attire for the industry and for the workplace? Are they the same? What soft skills will be appropriate for students to have? Career Services are called in to assist students when writing cover letters, conducting mock interviews in later classes, working with us on online and hardcopy portfolios. What does a designer or worker do in the classroom, and how can we work in those preparations in our own classrooms? What About in YOUR Classes? For students in my classes personally, they are pushed very hard. Their work needs to include technical mastery as well as strong conceptual work, a high attention to detail, and an excellent understanding of how these things are done. Many students consider me to be an arch-nemesis in early classes, and when they notice their level of control and understanding in later classes, consider me to have been right on schedule. In my mind, if a student is pushed to the brink, but delivers… they’re exactly in the right spot. If the workplace is as bad as a “bad day in a Dockery Class”… for them its just another day on the job. On the other hand, when an employer expects some good work, but they consistently provide above-excellent level care and performance… you have an employee who’ll be moving up in the world. Sometimes failure is the best thing that we can do for our students—we need to value these items more in the classroom. Business Administration has a course called “People Skills”. (in discussing this with Mark Monsky later, that program had already been discontinued). English 114 has a business writing class which can be used to enrich our students’ business vocabulary. Culinary has an etiquette class that outlines how to talk to others and clients, etc. Consider mock interviews with clients, and how do you phrase questions and things to help clients be clearer without overdoing it and upsetting people. Communicating clearly in collegiate environment is key. Speaking to them about emails titled “Question, Um…” are not appropriately, and materials need to be easy to read and very easy to communicate the materials. If you’re squinting at your own notes, you have some serious problems. We can stress the importance of writing and readable notes. One teacher noted that in low-stakes assignment she clearly says that “any pieces not using common writing conventions will lose AT LEAST half credit. Its a good wake up call in a low-stakes environment. How can you manage the amount of work coming home? Use the leeway the school has given you to ensure the amount of work you do. This was very vague. One of these items: Use the leeway the school gives us really seems to have missed the mark. Many of us teach 5+ classes in a semester, and have contracts with high numbers. Mine has 52 contact hours on the schedule and I’m not the only one maxed out in our department. We are paid for 5 office hours, but required to have many more which are unpaid. We attend some school events as a courtesy and others as a volunteer and are required to attend other events annually (such as recruiting efforts, open houses, booths, and industry events). 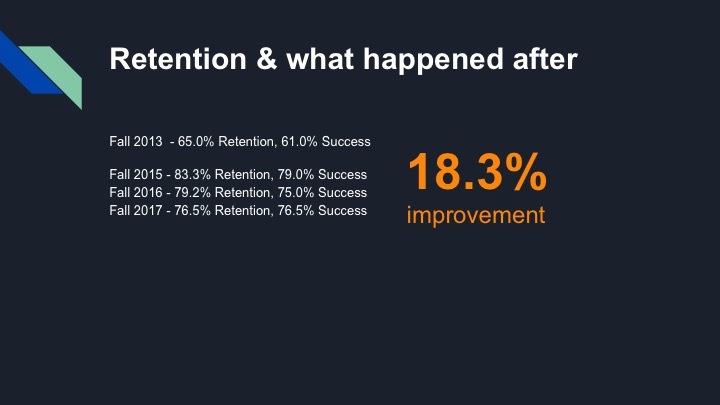 We undertake involved benchmarking projects, go to several conventions each year, and take well over 100 hours of professional development hours. Our classes take time, prepping old classes to reflect new software and new trends in the industry takes time, committee work takes time, answering email takes time, and we’re forced to work nights and weekends. Use the time you need. Email is a rabbit hole, but it can easily be a problem. If you schedule the grading and email to certain times of the day, you may find you have more time than you thought. Consider not even looking at email until 3pm (cannot happen as I know it). Consider turning things off as soon as you walk out the door. One Person noted (name redacted): Its in the policy that you do not have to contact with students on the weekend. Multiple People responded: Evenings and weekends are par for the course in online classes. Weekend and night emails or often appeals and questions. If those go unanswered, its a complaint to the dean, and so should be answered. Online students with problems and blackboard issues are not easy to answer. Ensure students that you will address the issue after you have talked with IT or BB and give us the trouble ticket and response. Another responder: If students cannot go on board with solving the problem themselves, why should we look into these issues. Should we have 2 due dates per week or 1 due date per week? There is no standard. Many people find that emailing at a certain time is healthy and sets a good balance. Students must have concise efforts. Anything which is too drastic gets pushed off too late, and has a chance of failing. Be Open and Honest About Responsivitiy— Especially with yourself. Perhaps taking a 10 minute walk every 50 minutes can reset your productivity. Don’t be afraid to tell students that you will not be responding. Share and be open. Students will be available and open to give you some space. After all, that’s what they want too! This entry was posted in Professional Development and tagged blackboard, business writing, career services, chew, cramming, DISC assessment, great teachers conference, group work, job skills, Mark, mark monsky, metacognition, monsky, Myers-Briggs, Myers-Briggs Personality Test, Personality Test, scaffolding, soft skills, stephen, stephen chew, study skills. 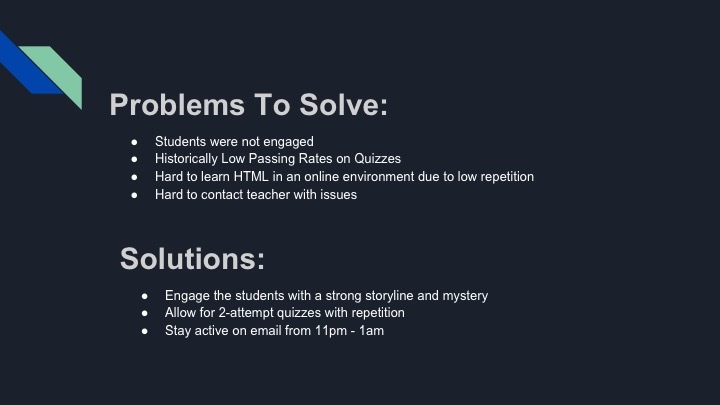 This presentation is part of a grant we ran in 2014, discussing the reason behind what we did, the lessons we learned, and how you might be able to integrate these ideas in your classroom. This grant was proposed and monies set aside to train and develop gamified systems in low-performing courses in the WEB curriculum model. In this first part, we will discuss some of these results. So, here we see a picture of one of my classes which was gamified, my 2014 class, WEB140 Web Development Tools. This graphic was used to help put students in the mood. It was nice, and captured the imagination of students right off the bat. At the time, WEB140 Web Development Tools suffered from a series of problems: As an entry-level course for graphic design, web design and web development degree programs, this course had a very high enrollment rate. This was offset by a very low passing rate among students, and low student engagement of students in these courses. 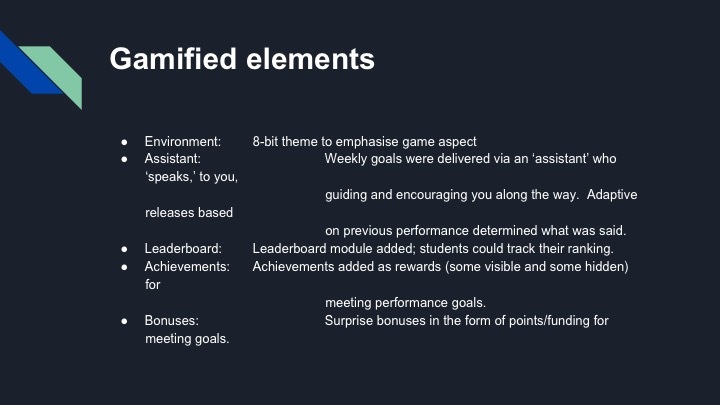 With our completions in this course at a very poor showing, I endeavoured to increase retention through greater students engagement by creating a gamified environment in which the students could learn and thrive. 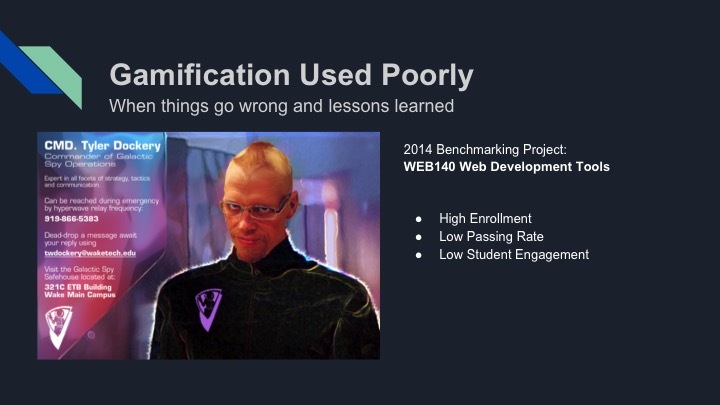 The premise of the gamification came across naturally. I contacted students from the last year in WEB140 across several different sections, and asked some open-ended questions about the material. What made the courses work for them? Where did they stumble or fall, and how could we fix it? 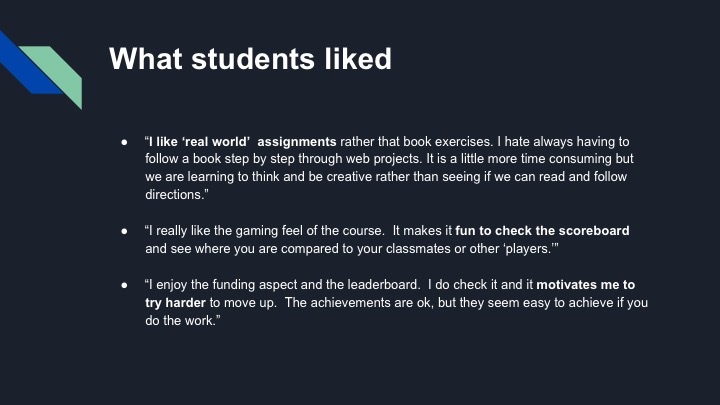 Students admitted that the reason they did not enjoy the web coursework was because they were not engaged, and could not “get into it”. Based on numbers, quizzes and tests scored low because students did not retain the information or glossed over the work. Because they learned the material once, created it once, and then moved on— many students felt that they could ignore the material. Later, as each assignment built upon the last, students found that they had not repeated the material enough to absorb it, and had “forgotten what to do” or “how to do those kinds of things.” Further, they noted that it was difficult to contact instructors about problems, because many students waited until the due date to upload or even begin their projects. I would work to engage the students with great artwork and a storyline which would allow them to become immersed. They would take on the mantle of an Intergalactic Spy, using artwork (through written permission on the part of the copyright holder) and a small adjustment to the storyline. Assembling code, building specific content, troubleshooting errors and problems, and generally assuring that materials could be made in an HTML environment, students would work their way through a 16 week story, one episode at a time, protecting a priceless treasure and solving a murder mystery. A key point for students was that they were allowed to skip materials with low grades. This compounded their problems with quizzes, midterms, and final examinations. The solution: Allow repetition of course materials until a satisfactory solution was found. Quizzes offered every two weeks would require a minimum score to pass. If a student did not receive the minimum score, or desired to re-take the material, they were allowed 3 scores, and only the largest score counted. In this way, students who scored poorly on basic tags would be allowed to retake the quiz multiple times. Until they scored the minimum amount, they had to take the test again, and if all attempts were completed, the student would then be allowed to proceed and had to keep a low score (but the highest score would count). In an effort to make students feel as if they could reach out to me (the instructor), I offered to be available from 11p-1a 4 days a week: Evenings on the first day of the week, and within the last 3 days of the week. 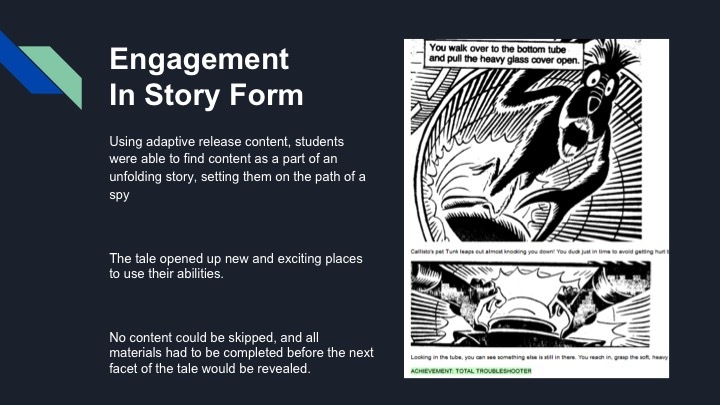 By taking the students through the materials one item at a time, student were exposed to a story in serialized form. Each decision allowed student to take quizzes and open things like a choose-your-own-adventure book. A strict list of deliverables were noting requirements each week, and each was made available one item at a time with encouraging messages and explanations. Great artwork moved them through the story with chunked information. Did it work? Not really. In general numbers, the course was a success, with students having much improved quiz scores and test grades. It seems this was probably an extension of the multiple quiz attempts and a larger pool of exam questions from which to draw. 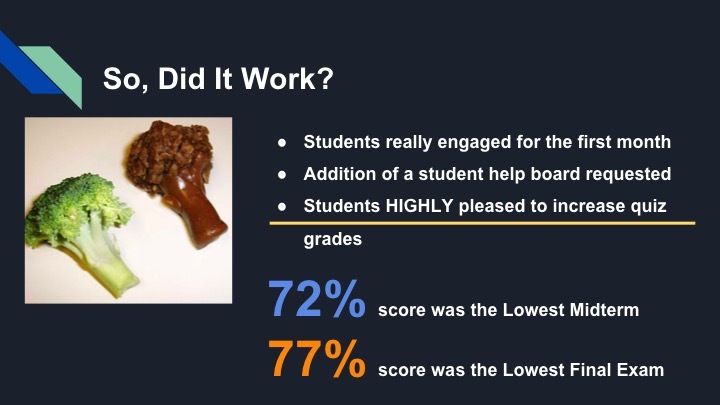 A numeric success, students noted they were actually less engaged in the class than they were in other courses. Students mentioned in exit interviews that the course was exciting for the first 8 weeks or less only. 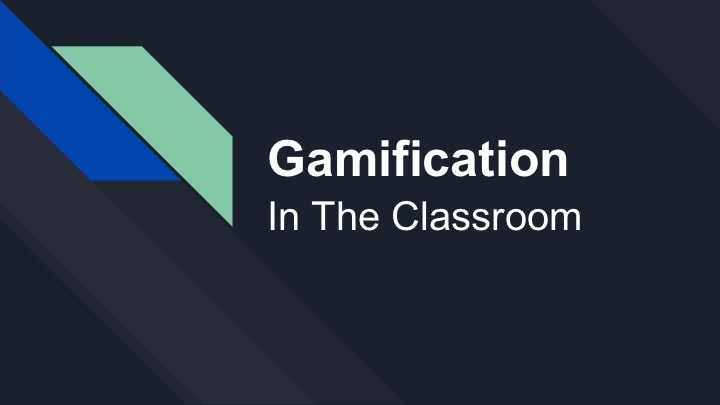 After 8 weeks, the gamification storyline began to become less exciting and more filler content which stopped them from getting to the real meat of the course. 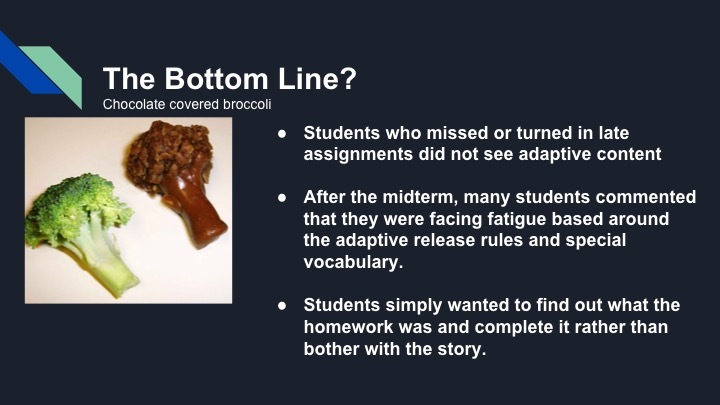 Students who missed assignments or failed to turn them in missed content, stating that they could not follow the story any more. Students who did not read the course material failed to understand that there were minimum quiz grades and found they were flunking early in the semester, and many chose to drop. 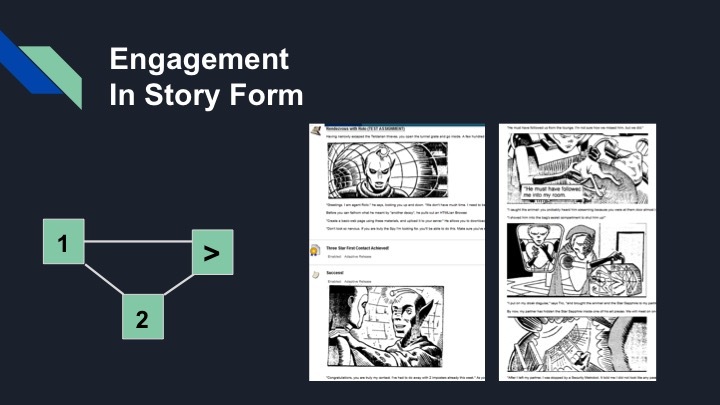 In WEB141 Mobile Interface Design, students found that they were highly disengaged with the class, noting that book materials were very paint-by-number, and had little to do with real life problems. Students found it difficult to tell where they in the class, with scores for midterms, finals, and assignments clearly defined, but still hard to calculate where students should put their efforts. 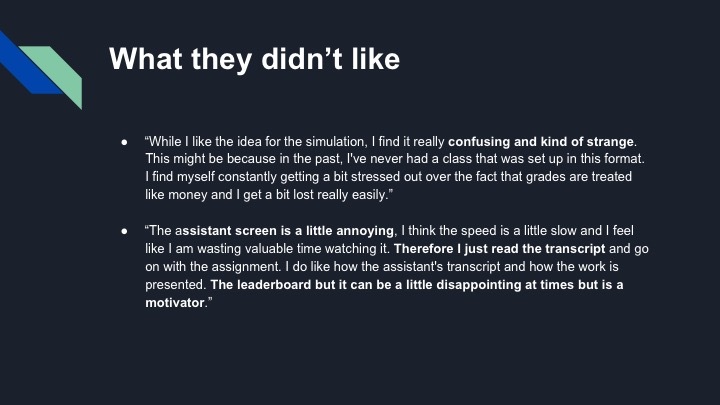 Student who fell behind in online courses felt that they could not gain any headway, and messing up on a project or two when coupled with the midterm left them flat with no way to raise their grade. To combat the issue, Nic D’Agata looked at the data and changed his tactics to better meet student needs. 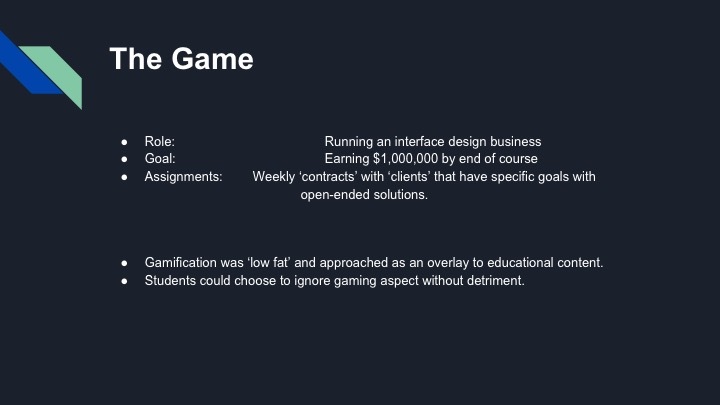 Since students in the first class found that the gamification content was a distraction, Nic built his material as an overlay. 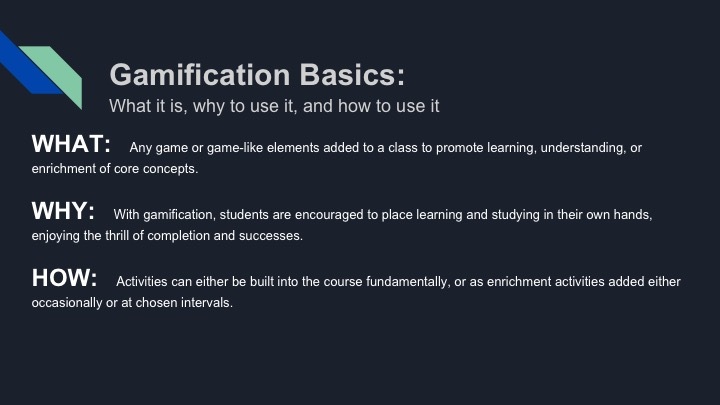 Content for the course changed little, with the gamification built over the top. 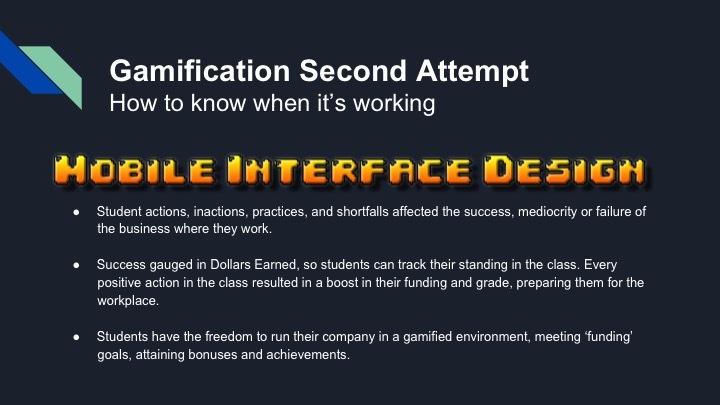 Students had the option to ignore the gamification elements without detriment to the course content. Many students found they could not tell which items were best for their grades, and the best uses of their time. Nic installed a system of “Money” earned through the course of the semester. Each week offered one or more project. Each project was a contract with a client, offering money for project which met the minimum requirements, and greater funds for projects which excel. Students were given the goal to reach $1 million by the end of the semester. Nic also included a leaderboard where students could see their progress compared to other students. No names were given, so no privileged information is released, but it could encourage students to work harder if they’re in the wrong spot. Students often found that getting behind was like getting in a hole too deep to get out of. At strategic points in the semester, students were treated to “Freelance” options, where they could troubleshoot existing code and earn money to increase their monetary income. This was essentially enrichment activities where students could increase their understanding or take on additional work to increase their grades. 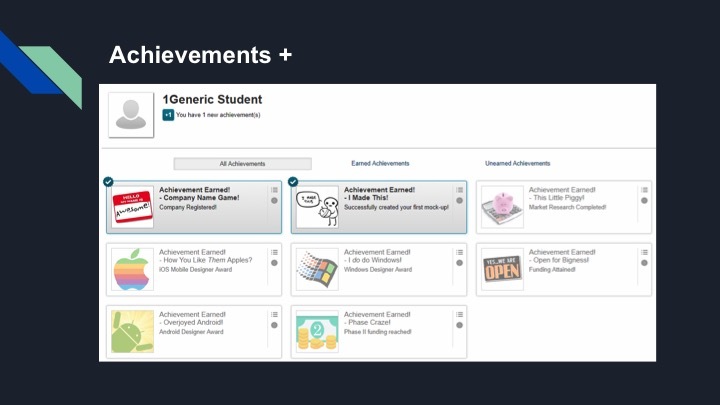 Using blackboard achievements and badges, students would be automatically notified of “industry recognition”. Students could see the badges and gain an instant warm fuzzy for having some minor graphics provided to them. 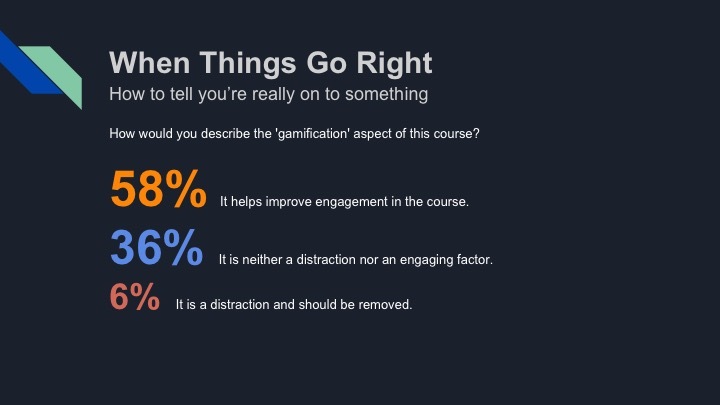 Overall, students reported that they felt more engaged in a course with open-ended projects and gamified elements. Some people found that the assistant screen was difficult to watch and they got tired of waiting. Some students felt the monetary system was hard to understand, and they were looking for answers in grade format. It could very well be that they had skipped over some of the early material, but there is no way to tell. The assistant is a moving digital display which lays out the information needed in each lesson. In some lessons this outlines projects, in others, it outlines specifics about the learning methods. While only a small number found it detrimental, it was almost a 50/50 split on Liking/Not Caring for the assistant. The leaderboard answered questions that many students had about their grades, their places in the class, and provided some good motivation. The material was helpful to most students, with many students noting it as a prime motivator. 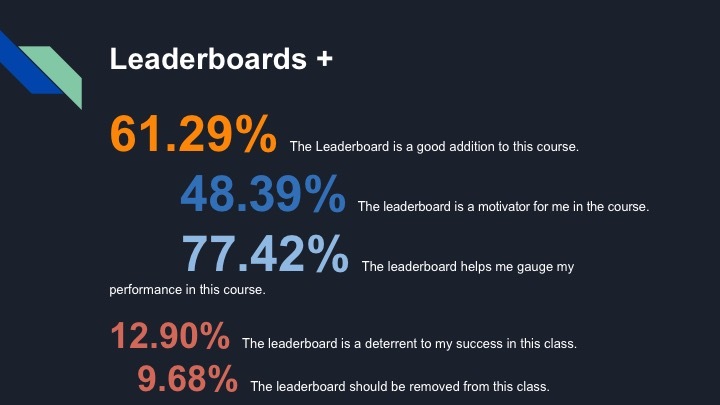 Some students (about 1-2 per semester) found the leaderboard to be a source of anxiety causing them to worry about their location in the class. 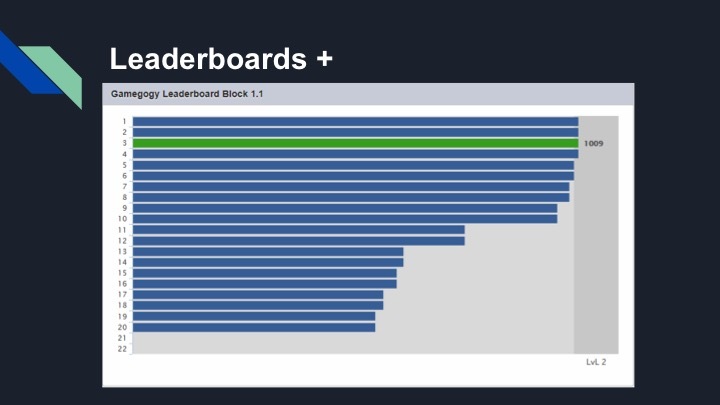 The Leaderboard was a simple tool plugin, and could quite easily be coded into your classes. At this point in the presentation, Nicolas answered questions about adding in the leaderboard. Using HTML code directly in his blackboard course, Nic added the leaderboard in to an older course as a demonstration. It was complicated, but well-received. At this point, we’ve talked about our personal experiences, so lets begin some insight into how you can add this to your classes. The blackboard badging and certificate systems are available to all current blackboard shells. They can both be accessed through the TOOLS menu options on the lefthand side. You can work with existing items, create your own, make your own certifications, etc. 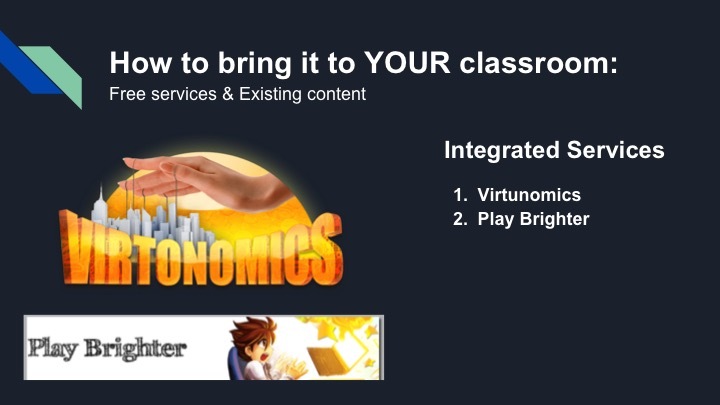 They are easily created, and can easily integrate with your course shells at any time. At this time, we created a shown, in-person demonstration on the overhead. 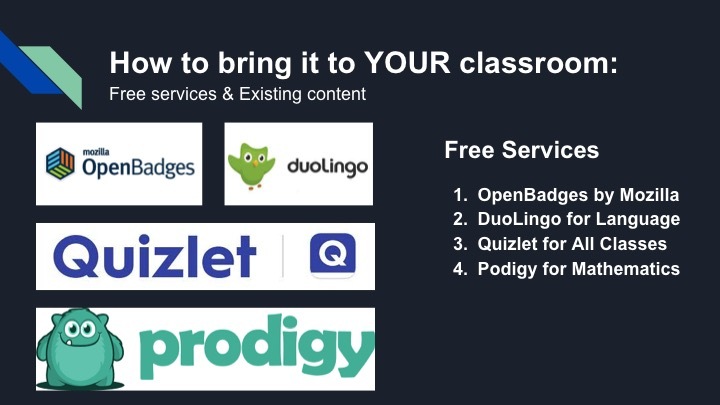 The services we showed at the end of the material allowed us to include Quizlet materials for easy self-study materials, online games like Play Brighter or Virtonomics, advanced tools like Duolingo, or creating your own badges and materials with OpenBadges. The material was well received, and we did a few extra demonstrations on how to include teaching materials from duplingo, integrating quizlet, and Q&A was fairly sedate. This entry was posted in Presentations, Professional Development and tagged badges, blackboard, classroom, conference, d'agata, development, dockery, duolingo, Engineering, Engineering Technology Building, Fall, gamification, gamification in the classroom, nic, nicolas d'agata, openbadges, play brighter, podigy, professional, Professional Development Conference, quizlet, Technology, tyler, Tyler Dockery, virtonomics, wake tech, wake technical community college, Wake Technical Community College Fall Professional Development Conference. 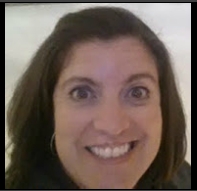 At 10:00am On 11/10/16 I attended Developing Faculty Mentors: The Low-Stress Option To Faculty Training presented by Geni Wright at the 2016 USCA NDLW Virtual Conference. In her presentation, Geni Wright spoke on how developing faculty mentors modeling best practices for online and blended courses is an excellent resource for new and established faculty. Faculty mentors provide a long-term training strategy that is both cost-effective and user-friendly. Faculty are often more receptive to fellow faculty suggestions for course revisions providing collaboration opportunities and development of future training modules based on common concerns and trends. Faculty mentors have the additional benefit of ongoing professional development, interdepartmental interaction, and are often included in the planning and training for early adopters of newly adopted technology at the institution. Geni Wright discussed that her school contains only 175 faculty members at her school, and this required a team of 3 faculty members and a growing system requiring 1 faculty mentor per department moving forward. Faculty chosen for these mentor positions are ones using the universal design theories and practices in their classes. We need the faculty to facilitate and participate in the program are the ones who are showing the best use in their classrooms. As a school which participates in Quality Matters (QM), faculty mentors participate in an internal peer review process to assist faculty in alignment for initial quality matters pre-review. Quality matters at their school is voluntary. I found this to be surprising. It calls to mind the idea that schools of small sizes have a lot to offer, but not always what is needed for larger schools. Granted, this goes both ways. 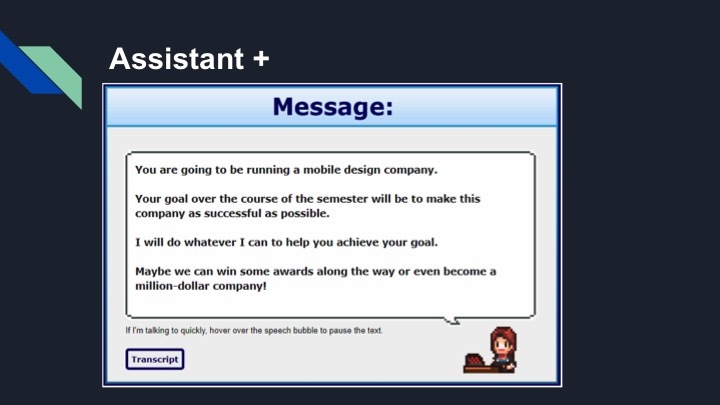 Moving into the latter portion of the session, the speaker discussed accessibility and objectives- issues we have covered heavily in our QM training here on campus, and moved into with EPIC. I was EXTREMELY surprised to find out how many schools are NOT ADA section 508 compliant with accessibility. Some of this was not useful. A major improvement discussed was the use of Starfish, a faculty student evaluation tool, but the speaker mentioned that many teachers at her college were not aware of how to use the blackboard gradebook, and not all teachers did use it. This was extremely disheartening. However, not everyone can be the best, so there was a good deal to learn overall, just not a lot of it was for me. This entry was posted in Professional Development and tagged blackboard, developing, EPIC, faculty mentors, faculty training, Geni, geni wright, matters, mentors, QM, quality, Quality Matters, starfish, training, wright. This Blackboard training class hosted by Linda Larson was a 1-week online course which consisted of three lessons introducing the Course Files area, basic accessibility concepts, and content tools including the Build Content area, creating a Content Folder, Item, File, URL, Image, Audio, and YouTube Mashup. After successful completing this training, I feel I have a much stronger understanding of the Course Files area and how to organize and add various types of content to a course. Most effective in this session was the explanations given regarding the course copy materials. A problem in the past was a full copy of the files area being added INTO the new course file area. This exponential increase in file sizes can cause blackboard class sizes to baloon into 5-10GB courses sizes. Linda Larson of Wake Tech Community College walked us through identifying these files and through the removal process. This entry was posted in Professional Development and tagged blackboard, content, file, files area, linda larson, YouTube. Today’s presentation at the NCCFA 2013 involved some great materials about blackboard, especially customizing the blackboard grade center. The blackboard grade center is a heavily-utilized area of Wake Tech’s classes- whether they be seated, online, or hybrid classes. I’ve been using the grade center for calculations since 2006, but today’s session was a chance to see a bit more of the features available in the latest upgrades to blackboard. Many of the features within blackboard I must admit that I already knew how to use. However, there was a great feature that Linda Larson pointed out, allowing blackboard grades fitting certain thresholds to be colored within the grade center. This allows grades for students who (in my case) get 60 or less to have their grade bar turn pink and for those receiving 50 or less on an assignment have their grade bar turn red. While this seems like it might be a train wreck, what you are doing is setting up a visual record which will quickly and easily let you see who is dropping or failing in a classroom. The latter half of the class was set up in a way to highlight the rubric functions of blackboard. While I knew a lot about using the rubric functions of blackboard for grading, there were several people who were unfamiliar with the process. Rubrics are great- if you feel like you cannot deliver bad news to students or you simply need things to reflect the objective nature of the grading platform, it allows you to assign gradepoint values or percentages to the pieces of an assignment along with commentary. This entry was posted in Professional Development and tagged black board, blackboard, gradebook, larson, linda larson, nccfa, nccfa 2013, rubric. In this online webinar, Wake Tech’s Jennifer Jones discussed ways of keeping students motivated and engaged in an online course. Her comprehensive visuals included all aspects of an online course. This session explored creating interactive learning activities that engaged students through unique, technology driven tools. It had a large component using discussion boards for classroom activity, using groups, wikis, and starfish response system. 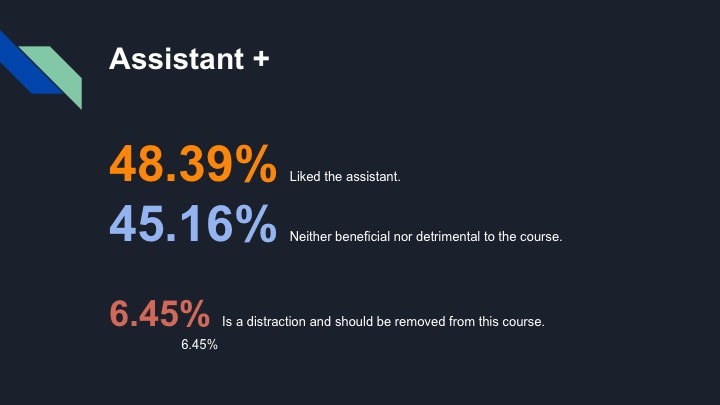 We briefly discussed using the texting system integrated into blackboard, although most respondents noted that they did not use this item as it caused too many issues with student expectations during the course. This entry was posted in Professional Development and tagged blackboard, discussion boards, jennifer jones, starfish. 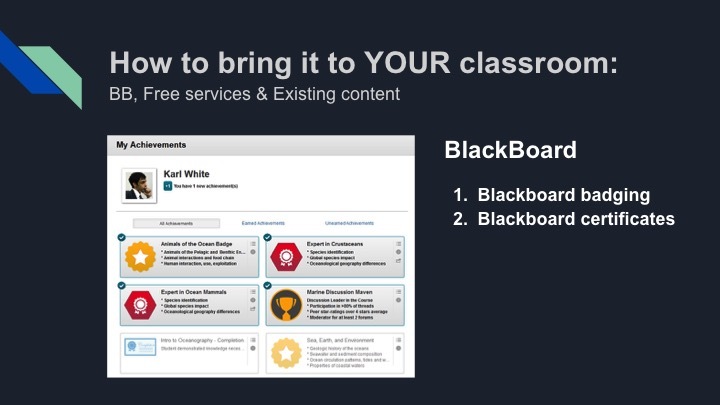 In this professional development course, I was able to get a glimpse of Moodle 2.0 as well as tips and ideas on organizing online course content in Blackboard for the migration to Moodle 2.0. Topics included an overview of how Moodle 2.0 works, saving and organizing files from Blackboard 9.1, moving quizzes and pools, and adapting assignments and activities for Moodle 2.0. This session was a demo only and did not actually include a hands-on experience for individuals. Moodle 2.0 is one of the newest flavors in LMS (learning management systems) for educators. Technically being around long enough to go through an original draft, Moodle 2.0 offers some great features with a price tag set to move. Well, the price tag for this item is set at $0.00 which is a price tag most schools can cope with. 1) Our division has really worked hard for a long time to prepare our online materials (since 2006) and now it is the required norm for the college. Our team in Computer Engineering Technology ( CET Division ) of Wake Technical Community College has endeavoured to place our online materials in blackboard using a weekly folder, with all materials for the week held within the folder itself- all learning objectives, all goals, all notes, all lectures, assignments and links to the discussion board, all videos, etc. 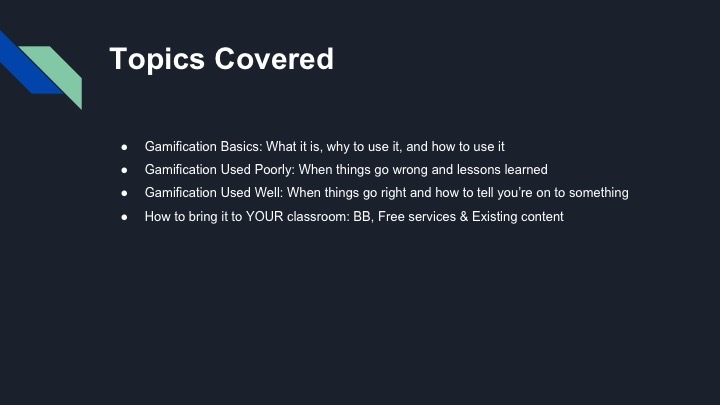 This has been an effort we’ve put into place in an effort to make all of our courses containing a common thread so that whatever course you were in, one week would be all you needed. Also, if you were hit by a bus and unable to return to classes, another teacher could simply step into the breach and release your materials one week at a time. In the new moodle system, this will be the required norm. It is nice to see that efforts within the CET division as well as the GRD (Advertising and Graphic design) and WEB (Web Design) departments were ahead of the curve on this one. 2) I am extremely suspicious of the $0 price tag. No price at all sounds great- on the surface. But what lurks beneath? Our IT staff works very hard to troubleshoot the systems, and get frequent updates and patches from the customer service teams at blackboard. How then, will a free system like moodle meet our needs? Is there not a great opportunity for security breaches, problems which cannot be helped by a help network which is manned by volunteers, etc.? If a system like this is free, how can they possibly be as responsive as a paid system with working customer service? How much will training cost to get each person in each department switched over to the moodle system? In the mean time, will we have to work partially in moodle and partially in blackboard? My suspicion here is that there MUST be a set of hidden costs- either in functionality, system use, customer support, number of users/licenses, etc. Hidden costs. That’s my thought, although I’m ready to make the switch if requested. I will grind whatever grist the mill requires. This entry was posted in Professional Development and tagged advertising, advertising and graphic design, bb 9.1, blackboard, blackboard 9, blackboard 9.1, blackboard course to moodle, blackboard migration, catherine bennett, cet, computer engineering technology, computer technologies, course migration, graphic, Graphic Design, grd, jennifer jones, migration, moodle, moodle 2, web, web design.